The plot, for what it amounts to, involves two pairs of lovers Mirtillo and Amarilli and also Silvio and Dorinda who after many vicissitudes are “re-united at the climax of their adventures” as heard in the bright, final madrigal Ombrose e care selve. But the poetry within the collection was uniquely sensual for its time and it clearly captivated Marenzio. In his 6th, 7th and 8th Books of madrigals he altogether sets seventeen of the poems. For some reason, not explained in the notes, Pedrini has only released sixteen of them on this disc although there was certainly space for the missing one. But for this listener it is a useful collection as I have recordings of Marenzio’s 1st, 4th, 5th and 9th books but I do not know of recordings of the others. So what of this composer? “Luca Marenzio was the greatest purely madrigal composer in the whole history of the Italian madrigal” writes Jerome Roche in his book ‘The Madrigal’ (Hutchinson 1972 page 58) and one in whose hands “it reached its culmination as a form with a musical life of its own”. What that means is that Marenzio was not a slave to that almost facile word painting you might find, for example, on ‘sospire’ or ‘crudel’ or for English composers ‘die’ or ‘fall’, no, what we hear is an overall mood, which moves subtly between optimism and uncertainty, passion and conviction. Marenzio completed what seems like a formidable number of madrigal volumes scored for between three and six voices and they were amazingly successful in demonstrating the composer’s complete fluency and mastery from an early age. The later madrigals, which concern us here, throw off the more Arcadian innocence of the early books for a serious and rather mannerist style, which incorporates continuo in a significant way, as in these performances. This offers the chance of the ensemble being either unsupported by the instruments or having a solo voice with continuo, or two or three parts with continuo and for contrast, an occasional passage ‘a capella’. This mostly enables more speech rhythms to carry the music forward as was typical of the early baroque period of the next generation, especially Monteverdi. The long, soloistic madrigal with dominant continuo beginning Se tu dolce mio ben from Book 8 is a good example. Harmonically we are now in quite daring territory, verging on Gesualdo with remote modulations and false relations. Keeping the tuning intact and yet being totally expressive and sympathetic are major challenges for the performers. La Pedrina consist of five voices with just one soprano and four continuo instruments, harp, lute, gamba and harpsichord played by Francesco Pedrini himself they are quite closely recorded but very evenly balanced. 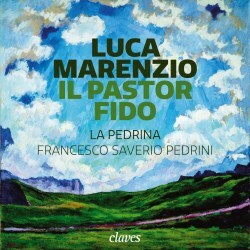 Several high profile vocal groups have of recent times, been recording complete, single books of Marenzio for example Concerto Italiano (Book 1 in four parts) and La Campagnia del Madrigale (Book I for five voices) so it is a particularly good idea by La Pedrina, founded only in 2016, to gather together examples on a theme from these later, and at present, less well known volumes. I have much enjoyed their work and presentation of these pieces. It is not their fault that the mood can often be very similar between each madrigal but it does come as a relief when we have a text such as Com’e dolce il gloire, o vago Tirsi (‘How sweet it is to meet, O dear Tirsi’) which offers some sunlit relief, even if the singers don’t always capture the right lightness of touch. The texts are offered in the original but also in wonderful ‘historic’ translations. The English one dates from 1647, a rather free example which its best not to study too deeply but a beautifully poetic one by Sir Richard Fanshawe. And I am reliably informed by my linguist son, the French one of 1759 by Antoine Pecquet is slightly closely to the mark. Even so, the concept and the whole project is commendable. Se tu dolce mio ben mi saettasti/Dorinda, ah dirò mia, se mia no sei/Ferir quel petto, Silvio?